Let’s get a few statistics out of the way for this ginormous park. Wrangell St. Elias National Park is the largest national park in the US, at 8 million acres. It’s the size of six Yellowstones, bigger than Switzerland and with taller peaks. Together with the Canadian national parks on its border, and Glacier Bay National Park, they form the largest protected area in the world. Nine out of the tallest 15 peaks in North America is in this park. 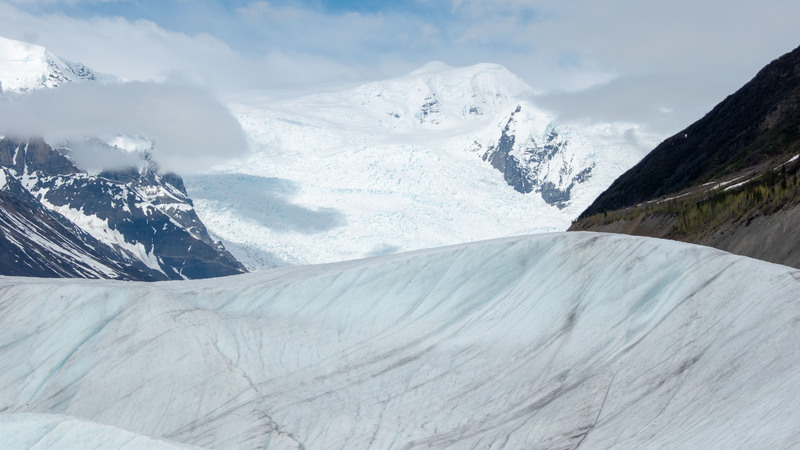 A third of the park is a big ice field that feeds more glaciers than anywhere else. Yes, this park is big! We arrived at Copper Center on an early June afternoon, went to the visitor center near Copper Center, and did our business (get the stamp, talk to the ranger, watch the film). There are only two roads in this large park. The northern route, called Nabesna Road, dead ends to a trailhead. 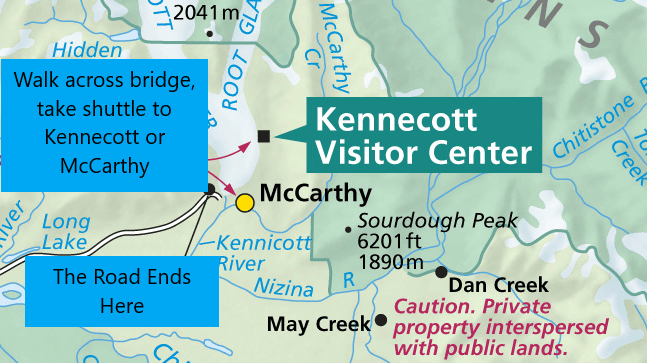 The southern route goes to the little town of McCarthy and an even smaller town with a huge mining history named Kennecott. Isn’t it ironic that a main attraction of the largest park is a historic mining town? While the park is huge, access is limited to dirt roads, back country hiking, planes and boats (the southern end of the park). We started our day in early June from the beautiful Copper River Princess Wilderness Lodge. The drive to Kennecott was a 113 mile journey, 65 miles of which was unpaved and narrow. It was sunny and warming up as we left around 8 AM. Although we saw many glaciers before we reached Wrangell St. Elias, we did not actually go ON a glacier. The previous options offered were to take a small plane and land on a glacier – a little too pricy for us, or take a strenuous day long/overnight hike – a little out of our league. When I saw a hiking trail to Root Glacier was only two miles from Kennecott, I jumped at the chance. 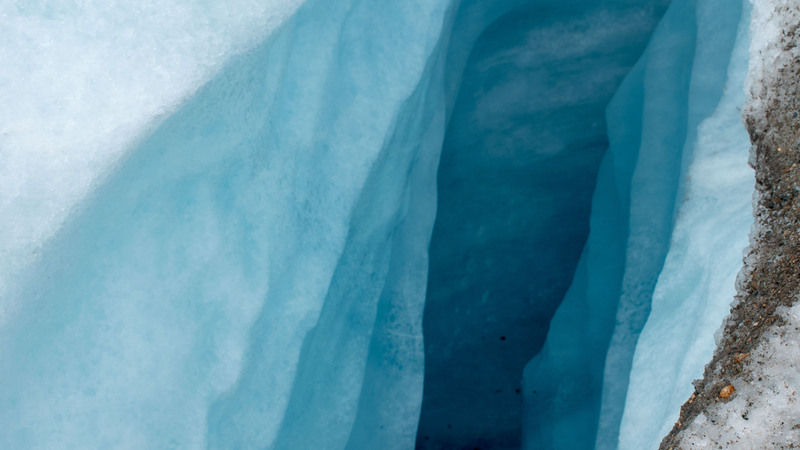 We hired a guide to minimize risk – since we didn’t know what we were doing and didn’t want to fall into a crevasse. 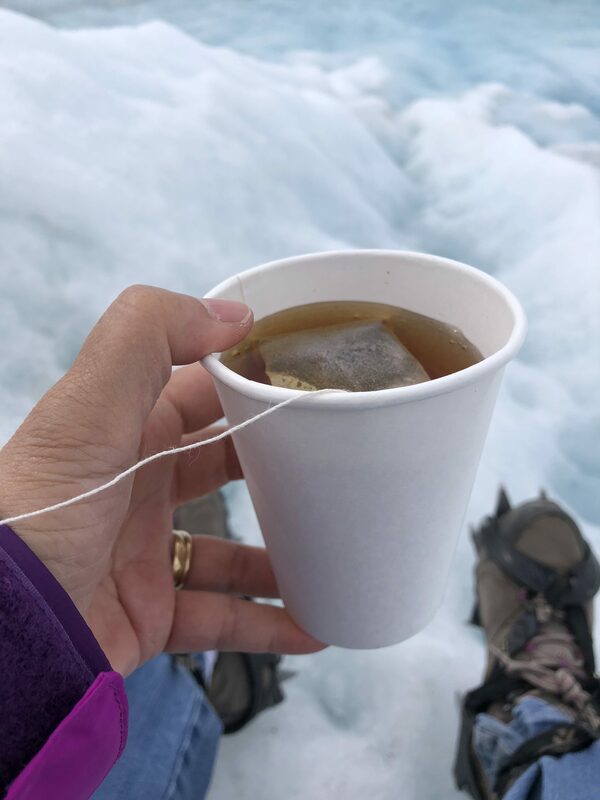 We also needed the proper equipment – a pair of crampons, so we booked a 1 pm half day glacier hike and was told to meet at the “footbridge” at 12:30. Getting to Kennecott is not straight forward. 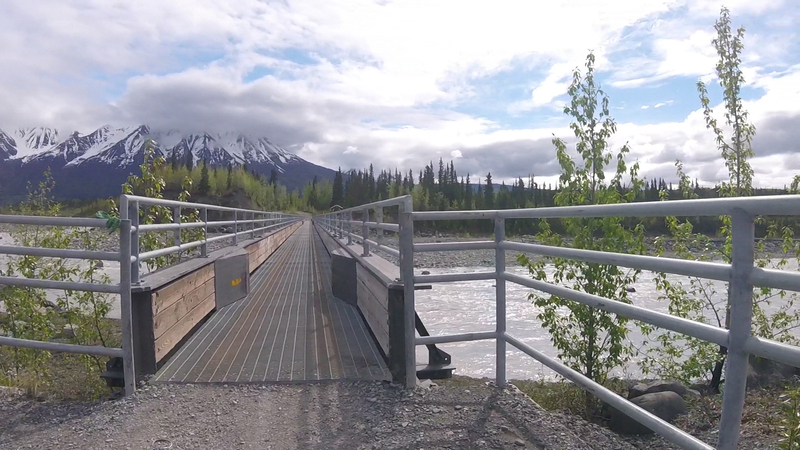 You have to drive to McCarthy, 65 miles of unpaved gravel road from Chitina, park the car for a $5 fee, walk across the foot bridge, take the shuttle ($5) from the other side and go another five miles on a rutted dirt road to Kennecott. I thought 4.5 hours was enough to cover 113 miles, even if some parts were unpaved but Google Maps thought otherwise. As we left at 8:00 AM, Google said the ETA was 12:48 PM to the foot bridge!! While I was confident Google was wrong, the debate raged in my head if I should tell Loretta about it and get her all riled up, or just play it cool. I decided I was right, and Google was wrong and there was no need to get her all worried. Besides, there was nothing different we could do. I kept quiet. Slowly, the ETA changed for the better as we rolled down the nicely paved highway 4 and highway 10. By the time we got to Chitina, Google showed 12:25 arrival time. Things were looking better! McCarthy road was notorious for washboards and potholes. I was very pleasantly surprised when the road condition, for the most part, was excellent! As the miles rolled by, the ETA improved. It was a good call to keep quiet! This was one of the very few times when I was right and Google was wrong. I felt so vindicated!! We learned later that May / June was the best time of the year for road condition because the road crew grades and repairs the road right after winter. As the summer wears on, the road condition gets worse. Still, it’s a long drive. We arrived at the foot bridge, parked our car, crossed a pedestrian bridge over a river, just in time for the 11:00 AM hourly shuttle. Right on time, a hardy looking lady arrived in a white van. Looked like it was only going to be two of us for the ride. I figured we would have some time to visit the Kennecott historical exhibits and have a nice lunch before our hike. Much to my disappointment, the dispatcher asked Kim, the van driver, to wait for the shuttle from Copper Center to arrive and it was “only” five minutes away. We sat there, occasionally swatting at giant but slow moving mosquitoes that came into the van. Five minutes turned into 15, as the shuttle finally arrived at the other end of the foot bridge. Six people got out, two of them walked right across the bridge and got into the van. The other four got out, looked around, posed for a bunch of pictures, looked around some more, walked very slowly onto the bridge, took more pictures…. Apparently no one told them we were waiting! Kim gave up looking at them and got into the van. Another 10 minutes went by and Kim looked up and said “Hey, what happened to the four people? They disappeared! They were in the middle of the bridge but they are not there anymore!” After another five minutes of looking around, she finally gave up and decided to leave. The 11:00 shuttle was now the 11:38 shuttle! There went our leisurely time of looking around the historic mining site! Kennecott was a copper mining town with important backers who had enough resources to build a railroad through very tough terrain and weather to haul the mined copper to the coast. Alaska was a district (not a state) in the early 1900s so very few laws applied. The mining company had free rein and vertically integrated everything from ore extraction to transport to smelting. This was a boom town until the ore ran out and the mine shut down in the 1930s. The remaining mining structure is the tallest all wooden structure at 14 stories. Life was hard for the miners. Mining was already hard work, but add the long, harsh winter to the mix, only the toughest came. Money was good but too many wasted their money on women and booze and ended up poor. We had an excellent lunch at the Kennecott Glacier Lodge and met our guide, Jonathan. Lucky for us, we were the only two for this hike! Jonathan was typical of the people we met. He was knowledgeable, friendly, passionate, and loves the outdoors. Like all the others, he was looking for adventure and a job that would take him to the great outdoors. He was full of interesting stories. Jonathan was very thorough and safety conscious. He would yell periodically, especially around bends in the trail where the visibility was short, so we would not surprise a bear. He explained the geology of the glacier and why things were the way they were. While we could have done the hike ourselves, it was so much more interesting and educational with our guide. We reached the glacier and put on our crampons. Jonathan showed us how to walk on the glacier (like a mad gorilla). Loretta said it the best “So you want me to walk like I’m mad at you and stomp my feet?” Jonathan said “yeh, that sounds about right.” Loretta then said “OK, this is a great way to vent.” and proceeded to stomp her feet and walk like a gorilla. It was magical to walk on the glacier, with 500 feet of solid ice below us. It wasn’t easy, but easier than walking on soft sand. There were only a few people on the glacier when we started but soon, it was only the three of us, on this huge glacier. The only sounds were the crunching of the ice under our feet, and the rippling water from the ice melt. The iconic blue glacier ice was just under the surface. There were little circular holes, white on the sides, blue at the bottom with a layer of brown dirt, full of glacier water. It was very pretty. We soon reached a magical blue pond with a 40 foot ice wall on one side. The pond was about 5 feet deep. Jonathan laid out a foam cushion, took out his camping burner, and made hot tea for us with the glacier water! It was the perfect setting for a little rest before heading back. The warm tea perfectly hit the spot. We were out on a glacier, by ourselves, serene and surrounded by majestic snow capped mountains and the 16,000 foot Blackburn peak in the background. This was the essence and magic of Wrangell St. Elias! While Kennecott is nice, the true calling card of Wrangell St. Elias is the backcountry and the solitude. We experienced a tiny taste of it on this short hike. 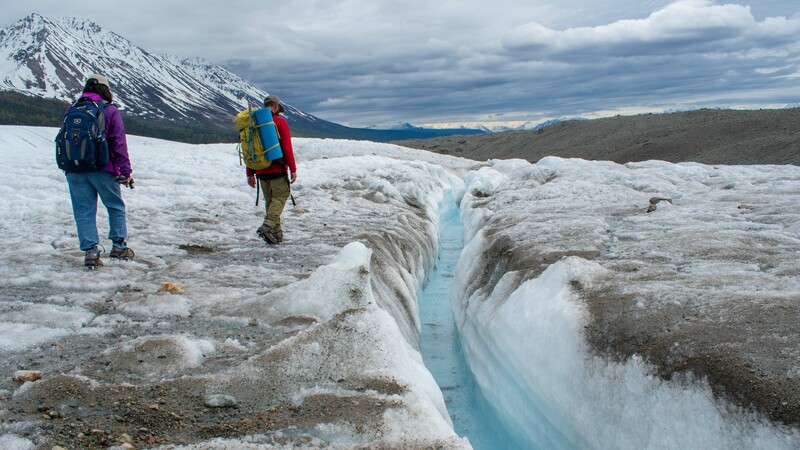 Wrangell St. Elias is an excellent place to get away from it all, find seclusion and commune with nature. It’s not for the faint of heart or the ill prepared. Nature can be beautiful or unforgiving. For those who are willing to put in the work, the rewards are magnificent. The glacier is ever changing. Less than a week ago, this small blue pond was much bigger and 15 feet deeper, but a channel opened up and the water flowed out. In a few more days, there won’t be a pond left. We walked along the new channel that opened up and it looked like a mini-canyon, 30 feet deep in places with a beautiful translucent blue canyon wall. I didn’t know what to expect before I visited this not-so-well-known park. What I found was an eclectic mix of history and wilderness. It was hard to get to but that difficulty protects it from crowds so it can offer seclusion for those who seek it. On the day we visited, I saw a tweet from Zion National Park that the parking lot was over capacity and closed to more traffic at 9 AM with up to 2.5 hours of wait for the park shuttle bus! What a contrast. As we finished our hike and walked back through town around 6 PM, we saw no one else. Wrangell St. Elias is for the hardy among us. No theme park crowd here, only national park people. The few people we met on the trail and at the historical mining town ALL nodded and said hello as we passed each other. It’s hard to get to Kennecott so the people who came really wanted to be there and that is beautiful! Big does not equal best. Ability to access the content is key, just like Wrangell St. Elias National Park is big but hard to access, limiting its appeal. 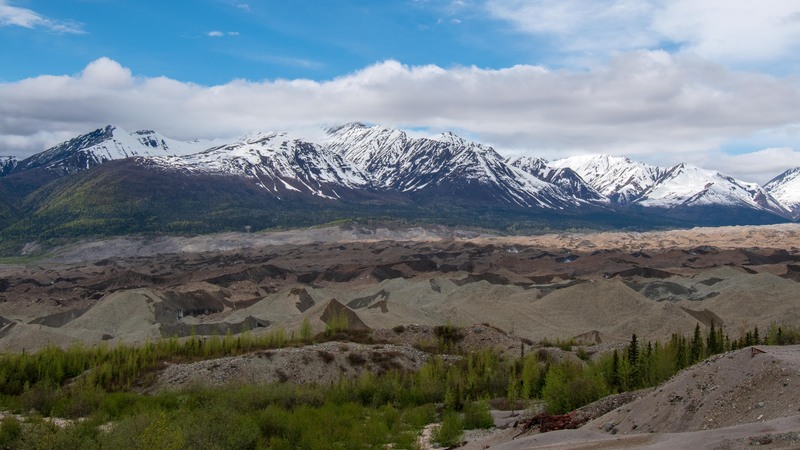 Wrangell St. Elias shows up on many national parks lists because it is the biggest. National Parks serve dual purposes – to preserve and to enjoy. This park tilts towards preservation with limited accessibility. To really appreciate the beauty of this park, you have to fly above it or hike deep into it. 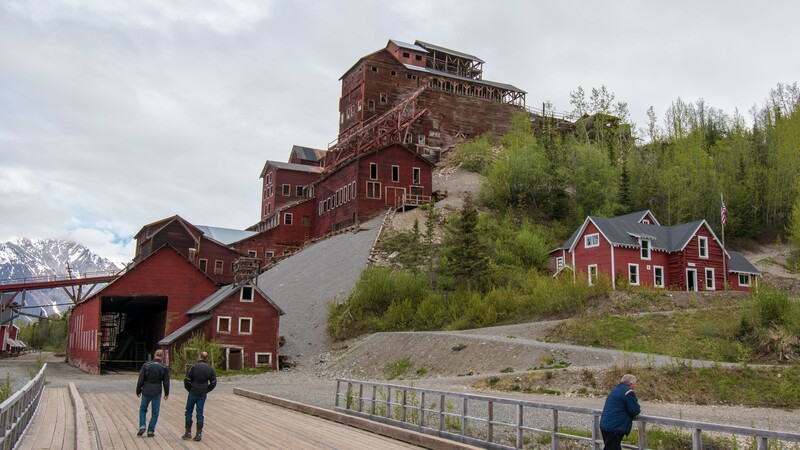 While Kennecott is historic and interesting, it is not the essence of the park. Wilderness and preservation are the essence of this park. Taken at that level, Wrangell St. Elias is a great park. 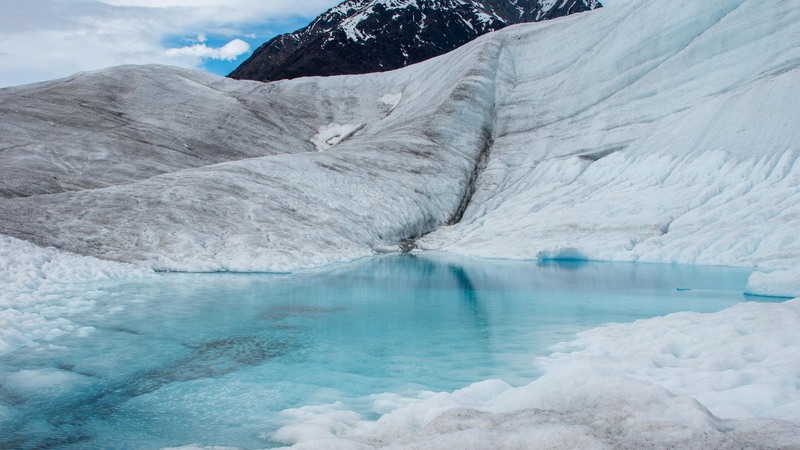 Have you visited Wrangell St. Elias National Park? Leave a comment below on your experience. Unless you want to go backcountry hiking, which is a main appeal of this park, one long day is enough for this park. Drive (or fly or take a shuttle) to Kennecott. Visit the historical mining town, have lunch at the lodge, and hike the Root Glacier trail. Spend some time on the glacier if you are equipped. The drive is long and not particularly pretty. A flight to Kennecott is much more fun with fantastic views of the mountain and the glaciers while avoiding the long and bumpy road. If you have a second day, drive the Nabesna road on the north end of the park. Hire a guide to get the most out of you time there. Fly to Kennecott if you can afford it. The scenery from above is much better than from the road. It gets you there a lot quicker and with much less hassle. Be prepared for bears. Keep your distance. Make noise. Don’t surprise a bear. Go on the glacier only if you have crampons. Hire a guide if you are not familiar with dangers of glaciers. Princess Wilderness Lodge is an excellent hotel with a wonderful lobby full of comfy chairs and a great view. Wifi is not available in the rooms but available in the public area. Rangers give talks at this hotel. Plan ahead. Lodging choices are limited near the park. Size: 8,323,147.59 acres, ranked #1. Including the preserve, it’s over 13 million acres. Wow, I’m envious that you got to Wrangell St. Elias! It’s been on my bucket list since I worked at Glacier Bay National Park for a summer in college, but (as you say) it’s hard to get to! It’s always intrigued me, and I thoroughly enjoyed reading about your visit!